We welcome you to the Home Page of the Tyburn Nuns - the Benedictine Adorers of the Sacred Heart of Jesus of Montmartre. 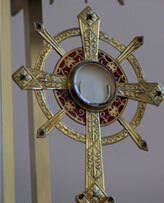 Our life is centred on Eucharistic Adoration for the glory of God and prayer for the needs of the whole human family. You see here the three elements of our dedication to our life of prayer. 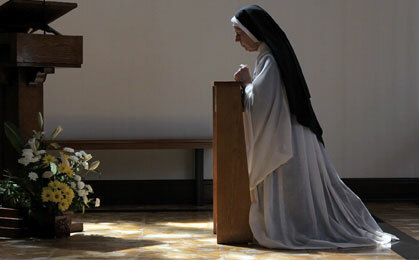 There is always at least one nun kneeling in silent adoration before the Holy Eucharist enthroned in the monstrance. In her hands the rosary beads are symbols of her intercession for all humanity. Here in the sanctuary of the Tyburn Chapel we see a nun deep in prayerful adoration and when the little gong is sounded another Sister silently replaces her and continues the rhythm of Eucharistic Adoration with deep reverence. Each Sister is marked for her special time of prayer throughout the day and night. This ensures a ceaseless cycle of worship of God which lies at the heart of our vocation and dedication.